Teamed with a weight and power of compact loader, this tiller rental has the power and breadth to make fast work of soil preparation for larger lawn or garden projects. 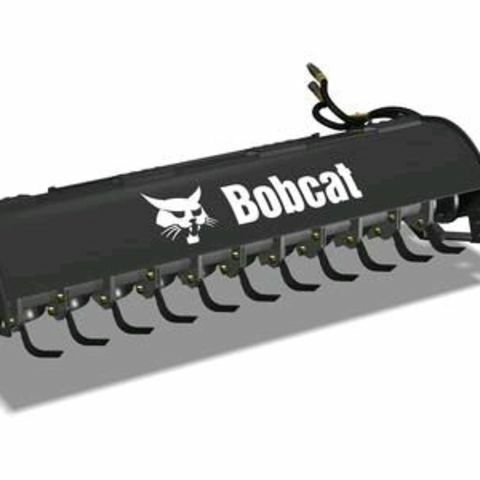 Just mount this hydraulic tiller attachment rental on a walk-behind Bobcat MT compact loader -- or other compact loader rental brands -- and let the double-edged tines break, till and mix up to six inches deep even the hardest soils. With a 40-inch working swath and the hydraulic power provided by the diesel compact loader, you can prepare the soil more quickly and thoroughly, while hardly breaking a sweat. Because the tines can rotate forward or back, you can or top-cutting and under-cutting in either direction. And even though it this rental can charge through broad swaths, because the attachment is offset-mount, and the tiller operates in forward or reverse, you can till safely near fences or walks.